DYNAMIC FORCES® - SUPERMAN #1 SECOND PRINTING SIGNED BY GEORGE PEREZ! 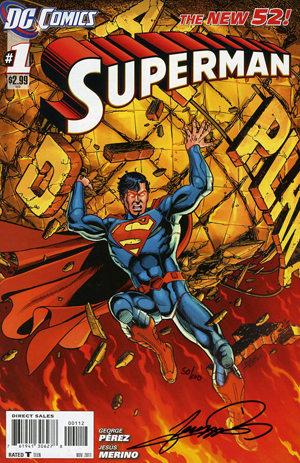 SUPERMAN #1 SECOND PRINTING SIGNED BY GEORGE PEREZ! The new adventures of Superman begin here! What is The Man of Steel's startling new status quo? How does it affect Lois Lane and The Daily Planet? There's no time for answers now, because Superman must stop a monstrous threat to Metropolis - one that he somehow is the cause of! ACTION COMICS #1000 BUYMETOYS.COM EXCLUSIVE VINTAGE COVER BY STANLEY ARTGERM LAU! 4. NEW 'ARROW' PREVIEW: "SPARTAN"